Spandrel glass basic feature is to cover necessary areas such as construction materials and commonly used between floors, ceilings, columns or spaces that require uniform appearance. Although durable, spandrel glass is also appealing and is nearly impossible to tell where one section of a building begins and ends. Available in Black and Harmony Bronze, Glaz-Tech Industries can help customize to a color of choice. Conceals areas from direct viewing such as marked wires, piping, and insulation. Satisfies both opacity and the criteria for fall out protection. Can be used with equal effectiveness on heat strengthened or fully tempered glass. 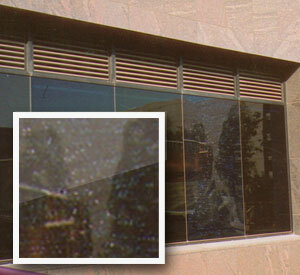 Tinted or reflective colors can be harmonized or matched to eliminate any "banding" effect. High safety and resistance to corrosion. Coating is used on clear or reflective glass. It can add shimmering jewel-like colors to the interiors of hotels, shops, restaurants, galleries, hospitals, as well as residential kitchens and baths. Tinted or reflective colors can be harmonized or matched to eliminate any “banding” effect even on high visible transmission glass. When OPACI-COAT-300 is applied to glass, a rubber-like elastomeric film is created which satisfies the criteria for fallout protection/safety glazing without the need for taping or the application of scrim films. Concrete, wood, & sheet rock are required to be primed before installing spandrel glass. Pin holes may be visible on spandrel coating and are acceptable by ICD Coatings’ Standards. Do not attempt to put insulation up to or next to spandrel glass. Special air gap minima are required (usually 1 to 2 inches). Keeps glass intact upon breakage.